Since the zero lower bound distorts the yield curve at very low rates, an inverted yield curve at low rates is worse than an inverted yield curve at higher rates. This is a reason why the curve didn't invert in the 1950s. The necessary adjustments here could be made either by just looking at the short end of the curve, recognizing that the long end of the curve will have a bias for a positive slope. 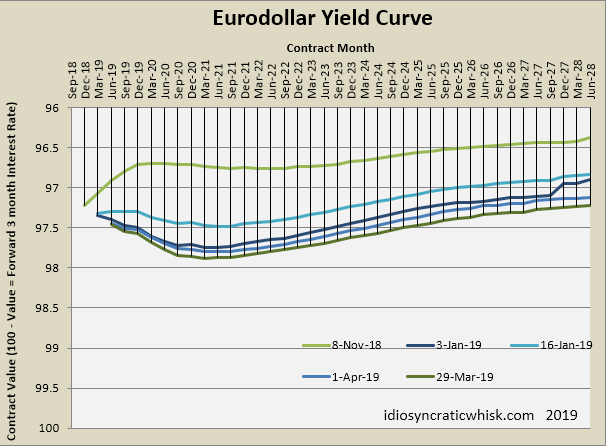 In the eurodollar market, the inversion of the short end is very deep. Today rates bounced up a bit. They will do that. In the post-WW II era, though, even though rates seem to bounce around within the inversion, yield curve normalization has only happened when the short end rate has been lowered. At this point, I have a fairly strong expectation that short-term rates will be well below 2% before 2021. The estimate using the 10-year minus Fed Funds spread also has us well into inversion. 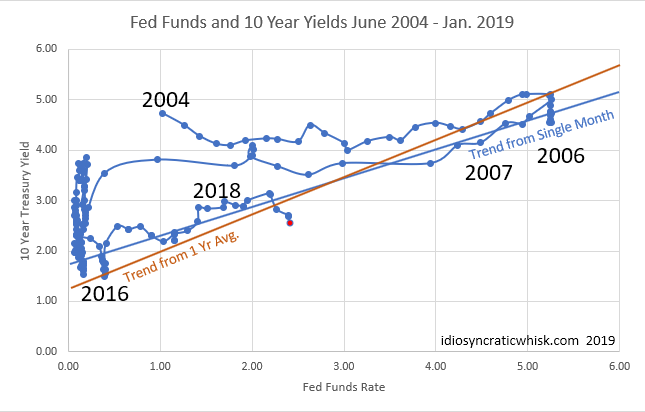 As this graph shows, in 2006 and 2007, the 10-year rate moved up and down without normalizing for some time, then, when the Fed finally lowered rates, the entire curve came down. The inversion from early 2006 to summer of 2007 was especially extended. I think the Fed was already sucking cash out of the economy far too aggressively for that whole period. The housing boom is what delayed contraction, because many households could access their home equity for liquidity. Lending was still growing at something close to double-digits even into mid-2007. Today, this source of liquidity is not significant. Mortgages are growing at low single-digits, if that. Home equity is still declining. General bank lending is at around 5% annual growth. So, I expect falling rates to come sooner this time. But, admittedly, I was surprised by a rising yield curve after the Fed raised rates in 2015, so my credibility on this point is worth the monthly subscription price to this blog.